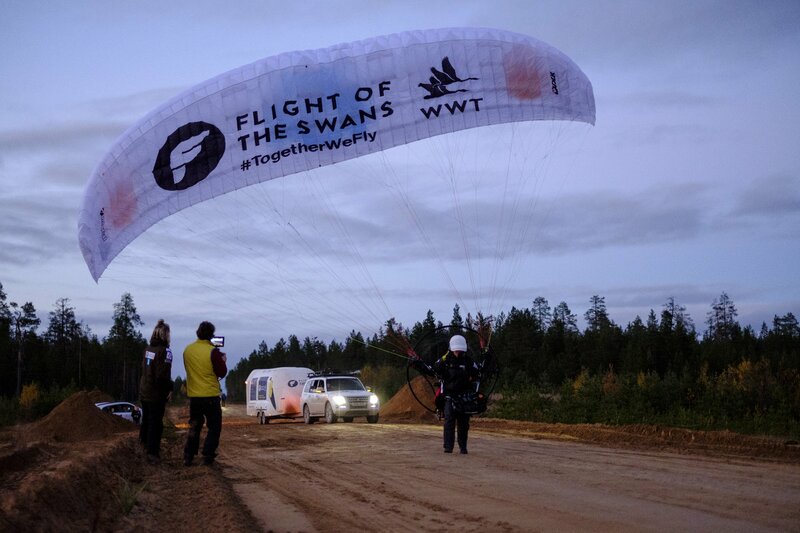 Whilst I wasn’t quite that succinct, looking back it’s not really surprising that I found myself two months before my ‘Flight of the Swans’ expedition still without a wing sponsor, particularly with so many voices in paramotoring saying I didn’t have a chance. 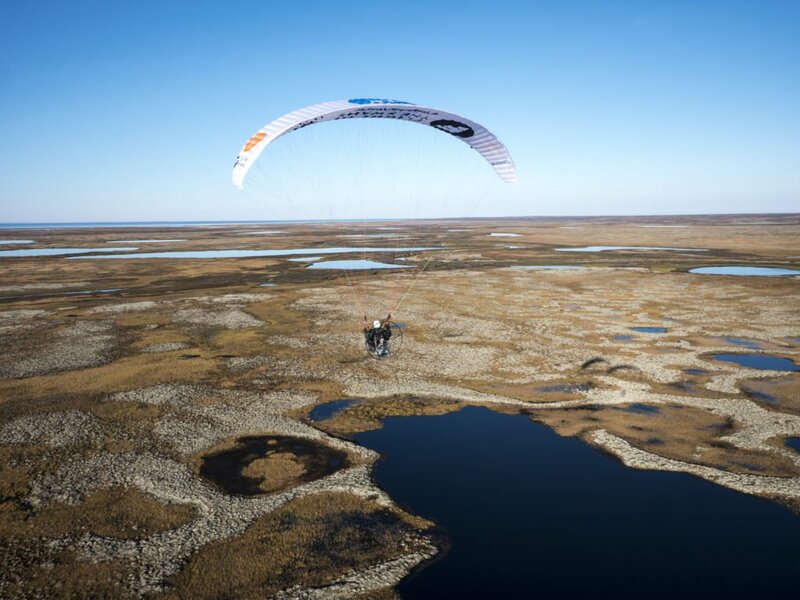 A paramotor was the only aircraft capable of taking me to all the remote communities I needed to talk to; that could enable me to see the swans migration from a birds-eye view, in effect, to get inside their world, their heads and try to find out how we can help them. If I was to have even half a chance of keeping up with the wild swans Maisy, Daisy Clarke, Leho, Charlotte, Hope and others, and do everything else I had to do on the way, the flying was the critical element. 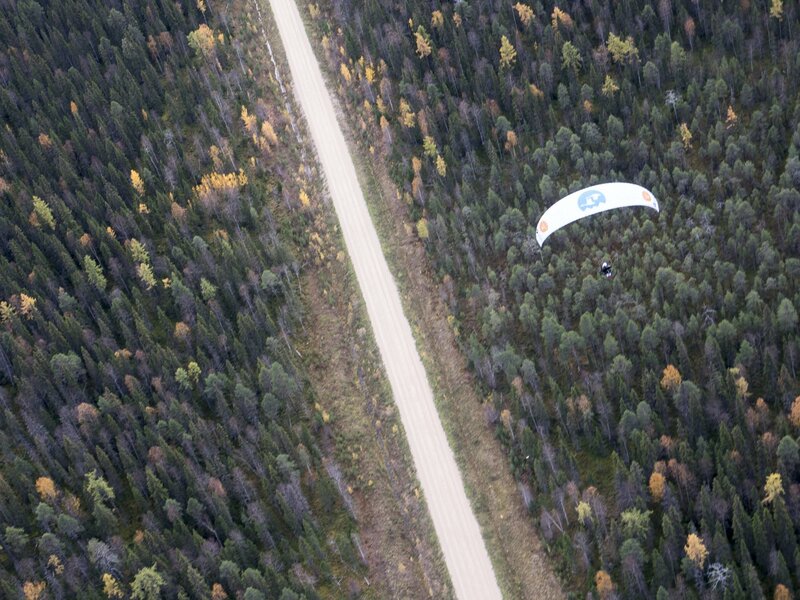 To boldly fly across the wilderness into poorly charted territory with no roads or back-up on the ground, I needed complete confidence in my aircraft. I needed a wing that was prepared to fly huge distances, fast enough to keep up with the migrating swans, slow enough that I could take off and land in the tiniest patches of bare dry land if need be, well-behaved enough that my launches and landings in remote places would be reliable and predictable (as the crowds of villagers that swarmed from miles around to welcome me usually weren’t). But I wasn’t there for the pleasure of flying, I had work to do, so my wing needed to be able to do a lot of the flying for me – keeping me on a general heading whilst I used my binoculars, took photos and film, recorded video diaries, took notes, communicated with regional air traffic, planned alternative routes mid air when the terrain was not as expected or conditions changed. And with almost 7,000km to fly, I needed speed but I couldn’t spend the entire journey standing on the speed bar. After a year of hard work and diplomacy it seemed we were going to crack the huge problems of visas, permissions and fuel drops, but I still didn’t have my flying machine and funds were a constant concern and limitation. Then all at once the various paramotorists helping me in other countries along the flyway, and some adventurous pilots in the UK, got interested (or took pity on me) and the resounding voice was – ‘For this, you need a Universal wing’. Thankfully after some calls to Dudek HQ in Poland, the offer I had been waiting for came through. Two Dudek Universal wings, a reserve, and 100m of spare line as gifts for the nomads (strong string on the tundra is gold). And for the next 3 months the Universal became my best friend. The huge speed range in the trimmers means you can fly slow to land in tight places but with trimmers out you get the speeds of smaller wings, all without touching the speed bar. The construction is beautiful and light to launch, but tough enough to take the inevitable beating from an expedition into the wilderness. The wing and I took off and landed in places I’d never have attempted had there been other options. It became an extension of me, and we achieved something a lot of people thought I wouldn’t. That’s not to say we didn’t have our moments of drama. 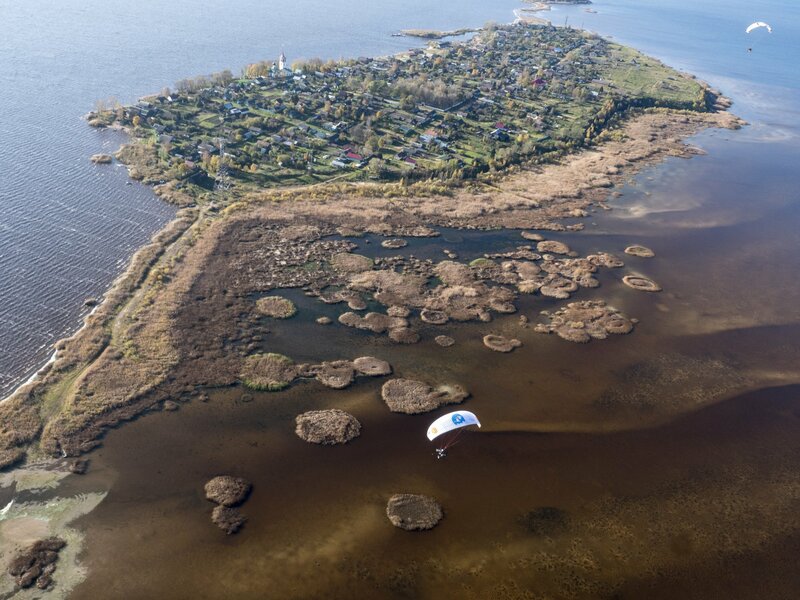 On one flight across Russia, where the tundra gives way to the taiga (the vast wet forests) the air was moving fast between the overcast sky and above the trees and swamps produced turbulence like I’d never felt before. It was like I was a puppet on strings, some odd entertainment for the northern Nenet gods that had bestowed their favour on me 'till then. My wing and I could be turned 90 degrees in an instant, then be shaken up and down like a puppet, with the air speed changing all the time by about 20kph. 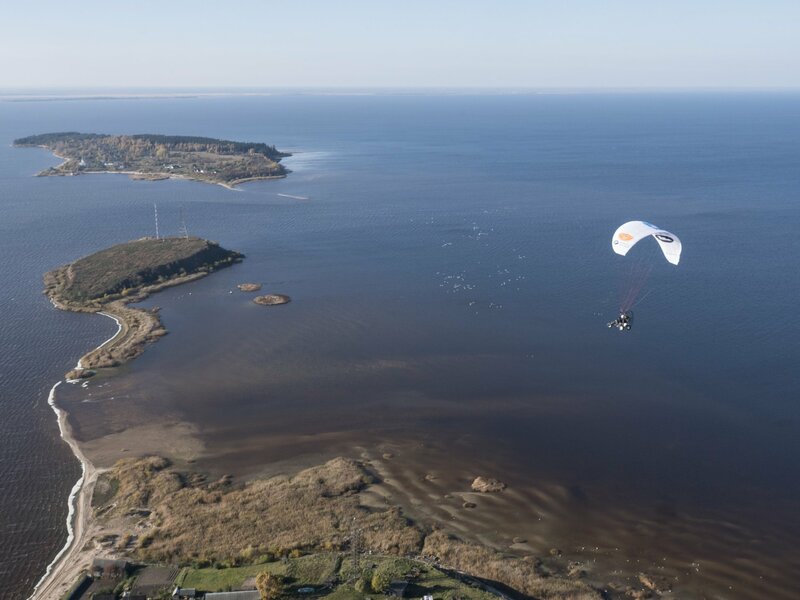 On one occasion I found myself flying at altitude because landing sites were limited, the wind direction improved with altitude, and the flocks of swans and geese were flying high at about 2,500 feet. But I realised ice was forming on my lines and I had to make a difficult choice to descend. 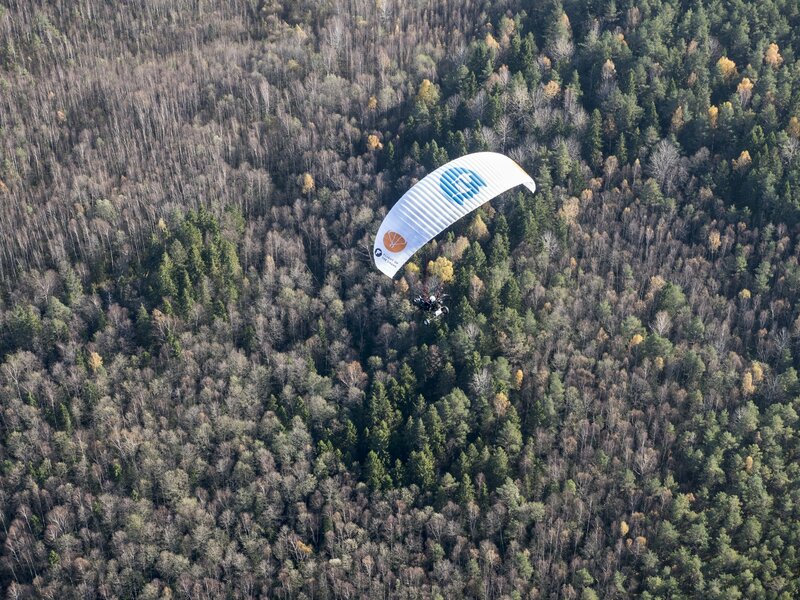 And on a flight across Belgium I had no choice but to launch behind a wind farm (on some parts of the journey, there were few areas that weren’t downwind of some wind farm). I put up with the weird rolling turbulence with rapid drops and climbs whilst the local pilots all bailed - it wasn’t pleasant flying but it wasn’t dangerous either, and I chose to carry on as I had home in my sights. Whilst these experiences would be terrifying for a novice pilot, SIV and the weeks of remote and challenging flying that had come before, gave me complete confidence in the wing, my skills and in my ability to distinguish difficult from downright dangerous. With that confidence comes freedom and a far greater chance of success; rather than land in the first survivable spot when conditions get tough, I could stay calm and focused enough to carry on, constantly reassessing, looking for a landing site that would not only be landable without incurring damage to me or the wing, but from where I could take off and carry on the expedition when conditions improved. So yes, there were moments of excitement, but I know those conditions could have been far worse on a different wing. On every occasion I was working with the wing, not against it. It was the extension of me that I needed for this trip. I’ve not flown a lot of wings but I’ve flown a lot, enough now to laugh at the pilots who have said ‘I wouldn’t fly that, it’s a beginners wing!’… and have then struggled to take off in relatively benign conditions with theirs. Each to their own of course, but getting this wing was some of the best advice I had for this expedition. 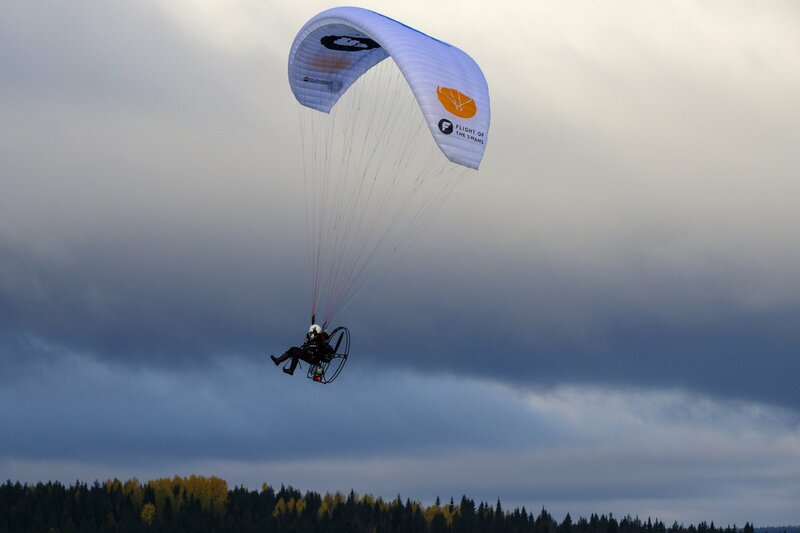 It was made for adventurous flying. Despite the hours and distances and conditions I flew, the worst I experienced was a few minor wing tip collapses. Perhaps the highest recommendation for the Universal might come from the two white-fronted geese that, over the wilds of the tundra, flew towards me and tucked in behind my right hand wing tip to get a free ride, as I had seen them doing with the wild swans. In that moment I really was just one of the flock. To all the sponsors and various pilots that helped me with planning and support, and who flew with me along various stretches of the route, I can’t thank you enough.